Well, Q1 is over and where is Asylum? Not on my doorstep, that’s for sure. So, what’s the deal? Well, the latest information is that it will now be released in mid April which is only a couple of weeks away. The reported retail price is $89.95 and there may be a DELUXE option that has more equipment including a chin up bar, bands, etc. However, like P90x there is apparently people modifying the moves for those without equipment. Now to keep to you tied over until you tackle this bad boy, here are some more details. 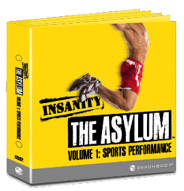 Insanity Asylum is the first in home sports training system which focuses on building strength, balance, agility, power, and coordination. 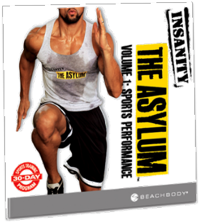 Insanity Asylum will be a 30 day program of progressive sports drills that will improve your skills, power, form, and focus, to help transform you into an elite athlete. The program will include a speed rope and agility ladder, to help you master the moves and improve athleticism. It also includes cross training with weights and resistance. Cross training with speed, agility, plyometrics, core, strength, and balance exercises. Series of progressions that take your results to the next level. MAX Interval Training in a sports specific application. Six DVD’s with 7 workouts plus a Athletic Performance Assessment (FIT Test). The MOST EXCITING part of Insanity Asylum is the Hybrid Calendars! This program will ship with 3 different, complete 30 day workout calendars. So even though this is a 30 day program, you can easily do all 3 calendars for a 90 day program, using the workout programs you LOVE! 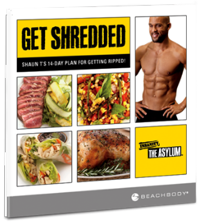 In this “Get Shredded” nutrition guide, you will get a 14 day meal plan. Shaun T encourages you to follow the 14 day plan twice for a 30 day period. If you follow the program, he promises results! Of course, you have to follow the plan! 1. All areas of fitness, agility ladder, and speed rope, weights, bands, chin-up bar. 2. Nutrition plan, energy, stamina, peak athletic performance. 3. Sports training tools, skills, speed, endurance, coordination, focus. 4. Proper form, improve mental toughness, focus. Graduates of Beachbody programs like P90X, Insanity, Turbo Fire, Chalean Extreme etc. Beginners, pregnant women, people who aren’t willing to work hard, people who don’t consistently do high impact exercises. Or people that ask “is their a modification” to the workout moves.